When you’re behind on bills, it seems almost silly to try and create a budget. You clearly can’t make ends meet so what good’s a budget? And where do you even begin? But budgeting is one of the best things you can do when you’re behind on bills because it will not only help you figure a way out, it will help you avoid the situation in the future. The basic steps for budgeting remain the same, but your spending will need to be adjusted. And you’ll need to spend a little more time assessing your current financial situation to get a clear picture of how far behind you are and what you can do to get caught up. If you’re behind on bills and you’re working towards a money plan to get turned around, here’s what you need to do to create a budget and get back on track. Putting off reviewing your financial situation won’t get anything fixed. I know it’s scary to look at the big picture, but it’s the only way you’ll get past this situation, so it’s time to get over the fear. You will never be able to turn your situation around if you don’t know how much work is ahead of you. You can’t change any of the past financial decisions you made that put you in this situation, but you can change how you respond to them from here on out. You need to know exactly how much money you have coming in and exactly how much needs to go out. Here what you need to review. Start by categorizing all of your expenses. Write down your monthly income; the amount that goes into your bank account each month after taxes. Then, write down ALL of your expenses. Every single thing you spend money on. Don’t leave anything out. Even if it’s only a few dollars, write it down. You may need to take a look at your bank statements for the last couple of months to get a clear picture of all of your expenses. Make sure to list all of your debt payments as well. Anyone you owe money too. Utility companies, credit cards, loans, collection agencies, absolutely everything. Once you have everything written down, you need to get it organized so you can what you’re dealing with. Put your expenses into 3 categories: Debt, Monthly Bills, and Variable Expenses. Debt: Write down all the debts you need to pay off, even if you are not currently making any payments. Regular Monthly Bills: List everything you have to pay each month. Include mortgage/rent, utilities, and cell phone bills. These bills are usually the same amount each month (or close to it) and need to be paid at the same time every month. Variable Expenses: These are your expenses that can change from month-to-month, like gas, food, household supplies, and entertainment. When you have everything listed, add up all of your monthly expenses and subtract that from your monthly income. Bonus Tip: you may want to do this on a spreadsheet so you can keep track of everything in one spot. Or grab my spending plan worksheet and start planning your budget today! You’ll find this and other budgeting tools in the Free Resource Library. If you’re behind on bills, don’t leave “savings” out of your budget. I know it’s tempting to do it, but if something happens unexpectedly and you don’t have an emergency fund to turn to, things could go from bad to worse. It’s more important to get caught up. You can always add it back in once you’re in the positive again. Note the bills you’re behind on as these need to be your priority. If you are starting a budget when you’re already behind on bills, it’s important not to fall even further behind. For each bill you’re behind on, list the past due amount so you know exactly how much needs to be paid altogether. Your creditors may be willing to work with you if you’re behind on your bills and they know you’re trying to catch up. Call and explain your situation. Ask what options are available for you. They may offer you an extension, or they may allow you to split the past due amount and add a portion of it to each of your bills for the next few months. This may seem like an embarrassing situation, but you are not the only one; they get calls like this every day. Remember that you can catch more flies with honey than vinegar. Be polite and kind; they’ve probably had people yelling at them all day. Things will be easier for you if the person you’re talking to likes you and wants to help. Be courteous and respectful, but speak with confidence. Be sure to ask for more than what you want; this is a negotiation so leave yourself some room. If can manage a monthly payment of $100 to catch up, start by asking for $75. This will allow your creditor a chance to make a counter-offer, and you’ll be more likely to get a payment plan you can manage. It’s okay if they tell you they can’t negotiate, that’s their job. Just ask to speak to their supervisor and don’t stop until you get someone who is in a position to work with you. Now that you’ve completely reviewed your spending habits; there are probably some things that came to light where you can cut back. Are you an impulse shopper and constantly add a few dollars for an extra purchase every time you check out in a store? It’s important to recognize your weaknesses, so you can get better at managing them and stay within your budget. Since you’re behind on bills, you’ll need some extra funds to get caught up. You have two options, either cut your expenses or make more money. Can you cut cable and get a streaming service instead? Change your cell phone plan to reduce your monthly cost? Or maybe skip the daily trip to Starbucks. More than likely you won’t be able to skimp on this step. You’ll have to make serious cuts to your budget so you can get out of the hole you’re in. I know it can extremely hard to make these choices, but they must be done. The best way to get caught up when you’re behind on bills AND stay out of this situation in the future is to increase your income. You may not have enough free time to get a part-time job, but earning extra money is important. Start researching opportunities to make more money. Sell the things you don’t need any more on eBay or Craigslist, have a yard sale, learn how to start an online business, find a part-time opportunity where you can make your hours. Opportunities are everywhere; you just have to look. Continue to track your spending and update your budget accordingly. Review your budget every month to make sure you’re staying on track. It’s not impossible to get caught up when you’re behind on bills, but it is challenging. Remember that it’s only for a short time and you’ll be in a much better financial position when it’s over. 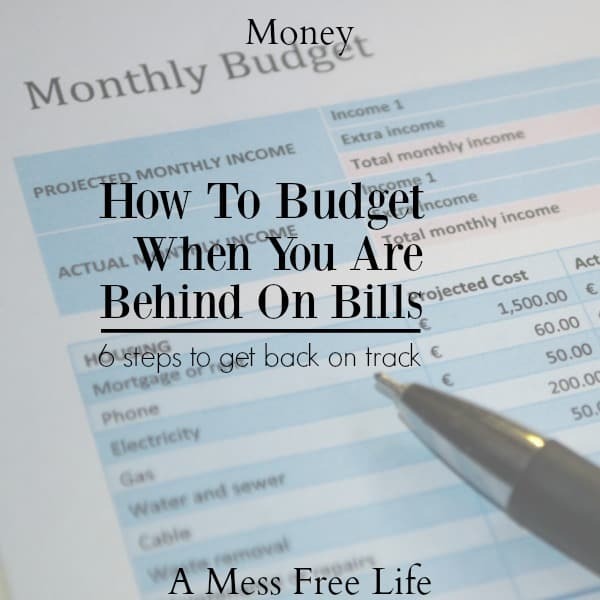 When you’re behind on bills, a lot of thought and careful action is what’s needed to ensure you can get caught up and out of the hole, you find yourself in. But the good news is with the proper techniques and tips, it’s not difficult to get caught up and even ahead. It just takes the patience, dedication, and good choices to turn your financial situation around.